The Venmar AVS EKO 1.5 HRV has an innovative design that incorporates extremely high performance motors that are equivalent in power to a compact fluorescent bulb (13.5 watts each), which enable the EKO 1.5 HRV to significantly lower energy costs without affecting its performance. Additional energy efficiency is found through its advanced heat recovery core, which can retain up to 80% of a home’s heating or cooling. 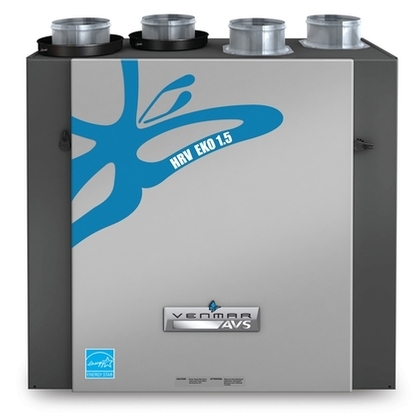 Ideal for small to mid-sized homes*, this balanced system offers superior indoor air quality and excess humidity control. Combined with the state-of-the-art programmable Altitude wall control, the EKO 1.5 HRV surpasses energy-saving standards while providing effective heat recovery and ventilation.